Many of you know that Rick Sternbach often auctions off items from his Star Trek days on eBay. You can always find his auctions here. 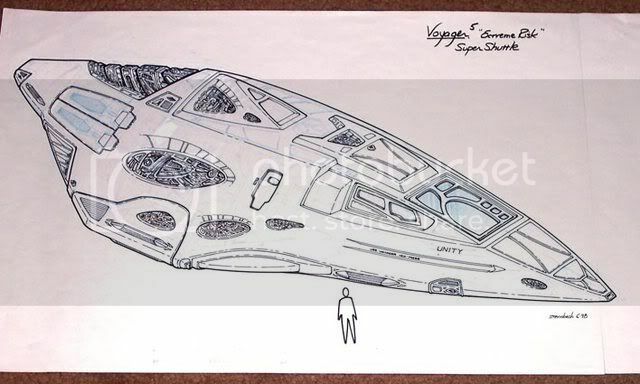 Well, recently Rick has been bringing out some of his old concept sketches, specifically from Voyager, and some are beauties. Make sure you look through his auctions and see if there is anything you like! Well, it isn't Star Trek, but close. 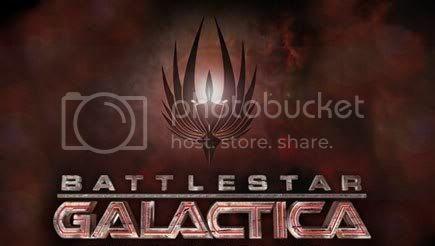 Heck, I will tell you that DS9 is my favorite Sci Fi TV show, but I will also tell you that Battlestar Galactica is the best Sci Fi ever on TV. It really is amazing as just about every critic in the country has found out. 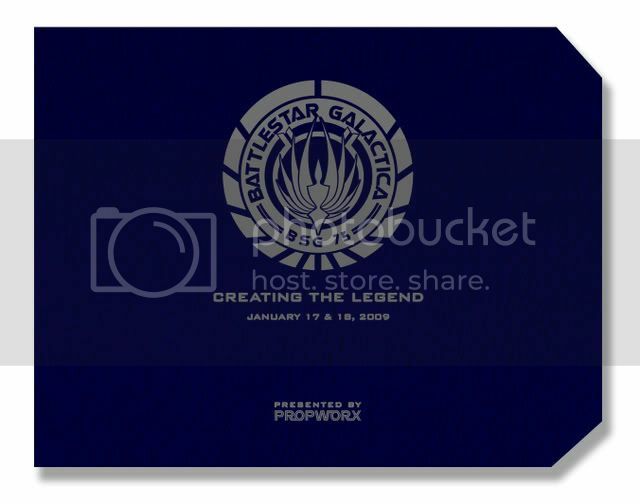 As you know, I am the guy Universal chose to handle the Battlestar Galactica Auctions.My new company Propworx, is hosting the auction January 16-18th at the Pasadena Convention Center here in sunny Southern California. 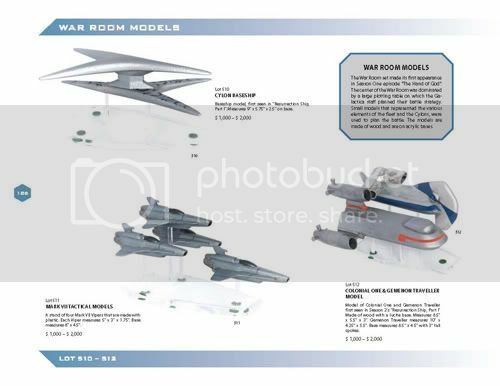 And we were fortunate to work with Star Trek Forum member Josef Philip from Austria, who did all the photography and layout. The result of everyone's work is impressive and at 320 pages, one of the best auction catalogs you have ever seen. You can order it by going here. A measly $ 35 and it is yours! 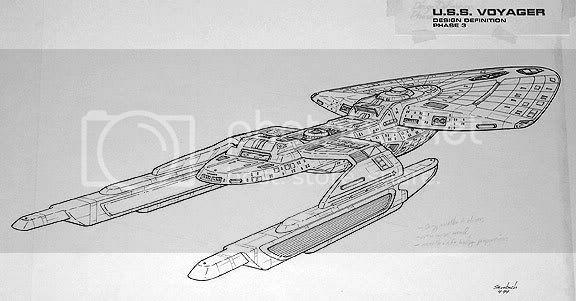 Screen Used, one of the few prop companies I recommend, often has cool Star Trek items, though sadly, they are often overpriced as Screen Used is only acting as a broker and thus the price is at the mercy of the consignor. One such piece is a beautiful Dr. Chaotica costume from the Captain Proton episodes of Star Trek:Voyager. The Dr. Chaotica costume has been on and off Screen Used for the past two years and is back again, at a substantially higher price...$ 4,499. This costume was on Screen Used last year for $ 2,700 and I passed on it then. Why this buyer thinks he can get $ 1,700 more in a saturated Star Trek market in a bad economy is beyond me. The costume was on Screenused for months at $ 2,700, which frankly was too high then. The seller here needs a reality check. This is a $ 2,000 costume max in this environment. As many of you know, I am a huge fan of the whole Captain Proton episodes in Voyager. I own Satan's Robot, the Delany sisters' costumes (both Mailcia and Demonica) and the Lonzak costume which I recently acquired from Dana Hammontree. I would love the Dr. Chaotica, but at this price it is ridiculous. I might pay half that. None the less, it is a beauty. 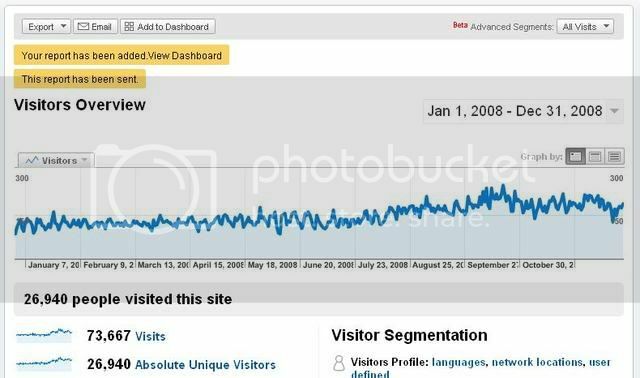 Well, the stats for 2008 are in and they are pretty good. Just under 27,000 unique visitors for the year. Traffic keeps going up and I thank you all for your patronage! I have decided to just go with Burt's system of auction week numbering. 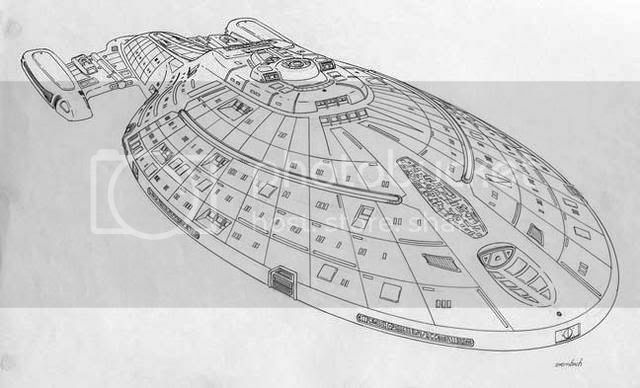 Check out the Star Trek Auctions Archive for any information you need on the IAW auctions! There were only 87 items in Week 104 and a really weak selection. Total sales were $ 25,402 and the average item was a paltry $ 292! Only 2 items topped $ 1,000 showing how bad a week it was. The Reman Military Uniform at $ 2,225 was priced right and about where these costumes usually go. It is a beauty. I have one and can say that it is the most amazing costume in my collection. The fabrics are fascinating and they must have taken a lot of time and money to build. 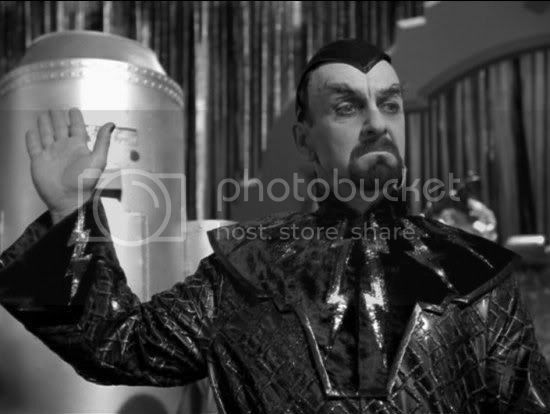 The Romulan Senator Cretak costume was won by my good friend Jim Williams at the reasonable price of $ 965. A cool costume from a good episode of Deep Space Nine, I think this was a good buy. These costumes have really fantastic fabrics and great structure, so they look much better on person and display very well. Poor Lt. Joseph Carey didn't last long on Voyager. I guess once B'ellana topped him for Chief Engineer, the guy had no future! But I do like his jumpsuit, as these costumes do look best in Operations Gold and he was a character that we saw a few times. At $ 935 a good buy for a nice costume. I also won an Officer's Belt from a Maroon Uniform, giving me every piece I need to put one together, save the actual jacket!. So at least I am getting there. I think it went pretty reasonably at $ 587. The USS Excelsior Bridge Model at $ 1,601, isn't really a prop, but beautiful none the less. This one is pretty cool and has a lot of neat little touches. It needs a bit of repair, but that doesn't take away from the historical nature of this piece. 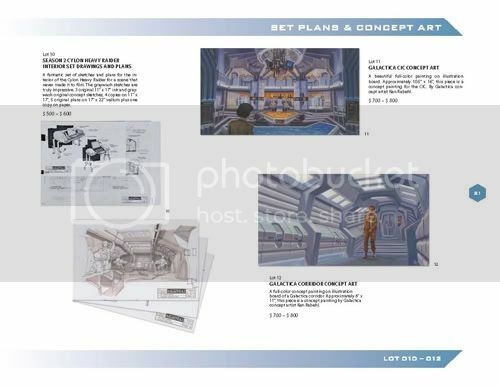 "A large console created for episodes of Star Trek: Deep Space Nine like “Defiant” where it served on the set of Cardassian Central Command, later in Star Trek X: Nemesis where is was altered to be a Reman console on the bridge set of the “Scimitar”, and again as a console in the Na’kuhl base in the Star Trek: Enterprise episode “Storm Front”." That's a lot of usage!! My buddy Jim also won a set of Romulan Senate Seats at the very reasonable price of $ 511. I am not sure ow many more sets they have, but I think they are a great deal around this price. The Enterprise Hero Universal Translator from "Demons" went for a very reasonable $ 355. I am not sure how different this version is from one we have all seen before, but still, a good deal. Finally, the deal of the week goes to the Borg Phaser at only $ 202! Granted it isn't complete, and most likely a background prop, but stil an absolute steal!! Best Costume of the Week: The Reman Military Uniform at $ 2,225 was the best costume in a poor week. These costumes are dynamite! Best Prop of the Week: The USS Excelsior Bridge Model at $ 1,601 was very cool! Best Buy of the week: The Borg Phaser from "Descent" at only $ 202!!! Sleeper of the Week: The TNG Operations Gold Starfleet Jumpsuit - female at only $ 330 was INSANE!!! The Galactica Quorom web site did an interview with me on the BSG auctions and you can hear it by clicking here. I think it came out pretty good! I hope you will all listen to it! There were only 80 items this past week. Total sales were $ 33,028 and the average item was $ 413. 8 items topped $ 1,000. 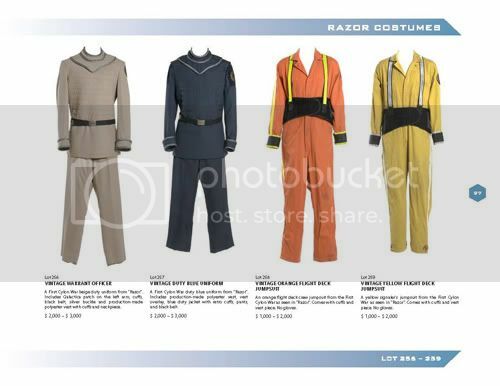 The Klingon Military Uniform went extremely high at $ 4,628. This is the highest a standard Klingon costume has gone for and it went to an experienced collector who also has the General Chang and Chancellor Gorkon costumes, so it is in good company. It didn't come with real boots either, so I think this is overpriced. The White Radiological Suit went very high as well at $ 3,383. I got outbid on this and I couldn't believe it. This went for over $ 1,000 higher than any other one has. Not a new bidder either, but he really wanted this! It was a nice one, but the price is much higher than any previous version. The usually go around $ 1,800. The Captain Sisko Commando Uniform lot at $ 1,563 was a steal. It had 5 pieces and 3 were worn by Brooks. My good buddy Dana won this, to complete his Avery Brooks costume, and he is selling me the vest to complete mine. Thanks Dana! The Borg Alcove Mannequin went for a strong $ 2,105, which isn't a bad deal. Pretty cool and will look great on display, at least for a while. It is made of foam, and these tend to disintegrate. The functional Reman Rifle was also won by my buddy Dana at a reasonable $ 1,525. These are beautiful rifles from the last Star Trek movie, Nemesis. I have one, and am very happy with it. The Teneebian Amethyst and Lock Box from the "These Are the Voyages..." was pretty cool. Forum member Donna won this, and she has been racking up the wins lately. At $ 1,325 I think it was fairly priced and a really nice item that will look great in a display case. Best Costume of the Week: The White Radiological Suit at $ 3,383 was high, but still a beauty. Best Prop of the Week: The Teneebian Amethyst and Lock Box from the "These Are the Voyages..." at $ 1,325 was different and cool. Best Buy of the week: The Captain Sisko Commando Uniform lot at $ 1,563 was a STEAL! Worst Buy of the week: The Klingon Military Uniform at $ 4,628 was way too high for one without real boots. Sleeper of the Week: The TNG Sciences Blue Starfleet Uniform Female Jumpsuit at $ 432 was an absolute steal! Star Trek: Klingon Military Uniform at $ 4,628. Star Trek: White Radiological Suit at $ 3,383. Star Trek: Nemesis functional Reman Rifle at $ 1,525.